Does the Ford Flex have third row seating? Home » Ford Flex » Does the Ford Flex have third row seating? Drivers in the market for an affordable crossover that offers plenty of space and top-of-the-line technology features may be interested in learning more about the Ford Flex. This crossover is known for its unique design, but if you’ve ever been inside one you’d truly know its worth. There is seating for up to seven in this three-row vehicle, so there’s plenty of room for both passengers and cargo in the 2017 Ford Flex. READ MORE: What’s the difference between the 2017 Ford Escape trims? Click here for details! There are three models to choose from for the 2017 Ford Flex: SE, SEL and Limited. 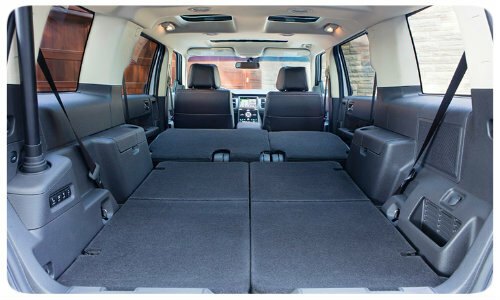 Each one is set with 155.8 cubic feet of passenger volume and 20 cubic feet of cargo space behind the third row. If the third row is folded down, it reveals 43.2 cubic feet of space. With both the second and third rows folded down, drivers will find 83.2 cubic feet of space for larger belongings. The driver and front seat passenger have 40.8 inches of legroom, second-row passengers have 44.3 inches and third-row passengers have 33.3 inches to stretch out their legs. In order to give you a better idea of what this vehicle has to offer, we’re going to explore some of the available features that make the Flex so desirable. As we mentioned above, there are three models available for the 2017 Flex. 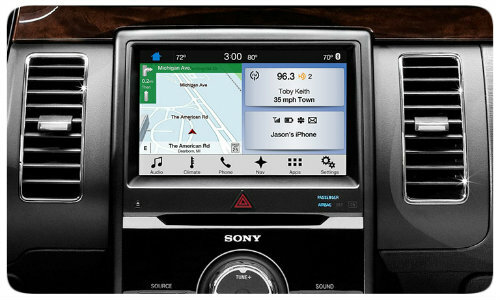 It’s important to keep in mind that not all the features mentioned will be standard on the base model. These features are just a glimpse of what the 2017 Ford Flex has to offer. Those interested in learning more about this vehicle are encouraged to contact our team here at Western Slope Auto for details. Drivers are welcome to browse the inventory online, and schedule a test drive when the Flex is in stock! What Colors are Available on the 2017 Ford Flex Exterior? This entry was posted on Monday, February 6th, 2017 at 9:34 pm	and is filed under Ford Flex. You can follow any responses to this entry through the RSS 2.0 feed. You can skip to the end and leave a response. Pinging is currently not allowed.